This author believes that pharmaceutical companies lie because they cannot tell the truth and stay in business. On July 15, 2003, I began to realize just how far my life had transmuted into the Twilight Zone. This thought struck quietly in the back of the room at the Wisconsin Department of Licensing and Regulation (DORL) headquarters in Madison. I had finally met Tim Bolen, who was working for an alternative doctor who had been attacked by the Wisconsin state medical board. I watched and listened intently as the crowd swelled while the subject of the cross examination, the state’s star witness, and current President of the National Council Against Health Fraud (NCAHF) testified under oath that he had, in fact, collided with cars on two separate occasions while jogging. Dr. Robert Baratz, MD, DDS, PhD testified that after both incidents, he had attempted to collect damages. Unfortunately, the 70-year old Dean of Tuft’s University Law School was driving the second car he ran into. Baratz not only lost the case, he was also ordered to pay the Dean’s legal fees. Dr. Baratz’s CV claims that he is a consultant to Congress. Under oath, it turned out that his consultancy was “testimony before a congressional AntiAging Committee against ‘anti-aging’ quakery.” There was a notable gasp from the audience after he testified that the “skin rejuvenation clinic” he owns and runs brags about the clinically proven power of antioxidants in the skin creams he sells.” He also testified that he had seen the studies supporting these statements. For me, it was just another day in the Twilight Zone. The disturbing part of my life that makes me certain I am somehow trapped in the fifth dimension is that I now know how to, and routinely show people how to, cure their heart disease. In America, thanks to Big Medicine and Big Pharma inspired laws, such “criminal” knowledge put one at risk of incarceration, however I also have the enormous satisfaction from former heart patient’s gratitude. I imagine that this is missing from the lives of ordinary cardiologists. I find that helping people cure themselves, sometimes only in a few days, is highly satisfying. This kind of satisfaction only comes from talking to formerly ill heart patients who report having become well in weeks, sometime a matter of short days. It seems that the dosage has much to say about the length of time that it will take for the patient to be cured. I am also satisfied when I hear that someone’s “untreatable” Angina has disappeared, but returns shortly after stopping the therapy. For me, there is a thrill in seeing EKG printouts that doctors tell me “don’t look like the same people” when comparing the printouts from before and after the therapy. These EGKs show damaged hearts that have somehow miraculously healed, that the dead muscle’s cells are now alive. Cardiology and the American Heart Association routinely advise against taking extra vitamin C. Recently, the admittedly preliminary Harvard finding that only one of 880 substances tested will stimulate undifferentiated mouse stem cells to differentiate into heart muscle cells did not make headlines. One reason for this is that vitamin C would compete with cholesterol drugs that now earn over $20 billion. The story behind this cure for heart disease is simple. This author recommends that people do the opposite of what cardiology and the American Heart Association routinely advise, and take vitamin C, the amino acid lysine, and a few other orthomolecular nutrients. The world’s only 2-time unshared Nobel Prize winner, Linus Pauling, has created a video outlining this information. This information has been readily available since 1993, but has never been reported in a mainstream news outlet or studied by medical science. Unfortunately, Cardiology and the American Heart Association, Big Medicine and Big Pharma do not want the public to know that curing heart disease is easy. People do it all the time. Maybe I’m living in the 10th dimension? A recent vitamin C study conducted by the Harvard School of Public Health found that in 85,000 women over 15-years, a single small vitamin C pill (360 mg) taken daily reduces heart disease by 30%. The same effect was not found from the vitamin C in foods, only the pills. Despite this data, the chance to save more than 300,000 lives (30% of the reported 950,000 annual heart related deaths) combined with the utter nontoxic nature of the vitamin was not enough for medicine to recommend that everyone take a vitamin C pill. The paper said more studies are required. This author’s experience over the last seven or eight years has led him to recommend 10-20 vitamin C pills daily, paired with an equivalent number of lysine pills, in order to completely eliminate the risk of heart disease. One could fear that Linus Pauling would roll over in his grave if he was alive to read the criticism of the Harvard Nurses Study, criticism posed by the current head of the Linus Pauling Institute. Showing his disrespect for the nurses’ abilities to keep proper records in the study, LPI’s Dr. Balz Frei commented on why pills (supplements) might have showed the profound decrease in heart disease, but not vitamin C in the diet, by stating that “its easier to keep track of the supplements you take, than to remember what you eat.” Using Frei’s logic, if they forgot to list foods with vitamin C, then one could surmise that the case for pills is even stronger, and the nurses in the “low intake group” were getting even more vitamin C in their food than reported. The difference becomes even more striking. The Harvard study, published in the July issue of CIRCULATION, does prove how damaging vitamin C really is, however damaging only to the bottom line of the pharmaceutical companies’ marketing of statin cholesterol lowering drugs. Not one trial of any of the statin drugs has ever shown a significant change in the overall mortality rates, when compared to placebo. According to Eddie Vos at health-heart.org, in all cases, after millions of statin pills, the mortality curves once graphed “touch” in both groups. “Vitamin C has been under investigation, reported in thousands of scientific papers, ever since it was discovered (circa) fifty years ago. Even though some physicians had observed forty or fifty years ago that amounts a hundred to a thousand times larger (than the RDA) have value in controlling various diseases, the medical profession and most scientists ignored this evidence” (Linus Pauling HOW TO LIVE LONGER AND FEEL BETTER, 1986, pg 106). We often hear about theories in the media that attempt to explain what causes cardiovascular disease (CVD), which often leads to heart attack and stroke. There is a cholesterol theory, a fat (saturated and polyunsaturated) theory, the long neglected Dr. Kilmer McCully homocysteine theory, an oxidized cholesterol theory, a free-radical/heavy metal theory, and even a microbe theory. Each of these theories attempts to explain what causes the lesion in the artery that is the precursor to CVD. At least one major theory is never mentioned in the medical journals or lay media. This theory is the vitamin C theory. Linus Pauling and Matthias Rath, MD, jointly identified the great problem of cardiovascular disease as a vitamin C deficiency disease; chronic rather than acute. This idea has yet to be seriously investigated by modern medical science. Cardiologists routinely tell their patients that there is no “proven” value in taking vitamin C for heart disease. Technically, this statement may be accurate, but it is misleading. The implication is that experiments have been run that prove high-dosage vitamin C (with lysine) has no value. No such experiments have ever been published. On the contrary, all research and experiments we know of provide evidence that vitamin C does, in fact, have great value. It is incredible that after more than two decades since Pauling and Rath first published their Unified Theory, modern medicine and its schools, pharmaceutical companies, and the United States government have failed to make the slightest effort to investigate the effects of large amounts of vitamin C and the amino acid lysine in relation to CVD and heart disease. This is even more surprising when one considers that there are no proven treatments for heart disease. According to Dr. Julian Whitaker, heart by-pass operations and angioplasty were never clinically “proven” before being adopted by the medical profession. The neglected vitamin C theory, proposed by Nobel Laureate Linus Pauling and his associate Matthias Rath, MD, is a unifying theory that encompasses homocysteine, lipid imbalances including Lp(a) excesses, infections and stresses, diet, free-radicals, lesions, and lack of CVD in most animals. The theory raises the important issue of mechanical stresses in the blood stream. The arguments are straightforward and most people can understand them. If more cardiovascular patients could learn about the Vitamin C Theory, this author believes that much suffering would end. Pauling’s recommended high-dosage treatment is having spectacular success among the lay public who have discovered it. Jeff Fenlason, age 55 of North Carolina is but one of thousands of people who have experienced the Pauling Therapy miracle. His case provides clear and convincing evidence in favor of the Vitamin C Theory. Jeff has allowed his real name to be used and his case is included in Volume One, and his entire testimony is posted at vitaminCcures.com. Fenlason is somewhat unique in that he did not have Chelation or any other alternative therapy before adopting the high-dosage Pauling therapy. His “two day” reversal was after ten years under the care of modern cardiology as a military veteran. His first testimonial can be found below. My name is Jeffrey Fenlason. I’m 55 years old and I have had Cardiovascular/Coronary Artery Disease or CVA for 10 years. Within two days after starting the high vitamin C/lysine Pauling Therapy (14 g vitamin C) I felt like a new man. Here is my story. I was first diagnosed with CVA in 1990 at the VA hospital in Richmond VA. In 1991, four of my arteries were by-passed. After the operation I was in worse condition than before it; I had angina daily and took oral nitro almost every day. The angina lessened after a year and it was possible for me to go days without the nitro for almost 7 years. In 1998 after moving to North Carolina my chest pains returned on a regular basis so I went back on the pills and then was on a daily time release Nitro. I had resigned myself to the fact that there was nothing that would improve my condition even though I was on several medications to help relieve my angina. On June 20, 2001 I had three episodes of severe chest pains and went to the hospital. They kept me over night and ran the usual test to determine if I was having a heart attack. (I had been through this experience many times in the past.) The next day I went home with all new meds and an appointment for stress test the following Tuesday; I was also placed on a Nitro patch .4 mg an hour that I could only wear for 12 hrs a day. Within an hour of removing the patch I would again need to take oral Nitro pills. That is when I did a search for CAV; the first sight I went to was www.paulingtherapy.com. I called the 1-800 number after reading everything on the site and left a message. Within a very short time I received a call from Lunes . He explained to me the Linus Pauling Vitamin C/L-lysine therapy. I started taking the cure that day. I was to be in Charlotte for the balloon on Monday morning, but I overslept (for the first time in years I will add) and was awakened by a call from the hospital. I was already an hour late and they wanted to know if I was coming or would reschedule. I told them I would reschedule. Then I went back to sleep (another thing I hadn’t done in years). Again the phone woke me. This time I was told, if I could make it in less than an hour and a half they could still do the angioplasty procedure. I thanked them for the offer, but told them I would rather reschedule. I was then told how important it was for me to get this operation done. I still haven’t called to reschedule. Within two days after this call I felt like a new man. My friends started saying things like “WOW you look great” or “Man I haven’t seen you this active in months” I had previously stayed home a lot when my wife went visiting. The most common words out of my mouth had been “I’m tired.” Well, since taking the Pauling therapy I am not tired all the time. After only a week I stopped taking the Meds that the doctor had prescribed when I left the hospital. It has only been 12 days since I started and I DO NOT HAVE ANY CHEST PAIN. If that isn’t proof enough for anyone with CVA to start taking Paulings therapy, then check back as I will be updating this report often. In the mean time GOOD LUCK! P.S. – Another startling occurrence in the last week, I have had joint pain in both hips for years and I have tried many treatments for the pain. It was just difficult walking around Wal-Mart. Well, for the past 5 or 6 days I have had no pain in either hip and I am walking quite a bit. And, no, I am not taking any type of pain pills. “Although physicians, as part of their training, are taught that the dosage of a drug that is prescribed for the patient must be very carefully determined and controlled, they seem to have difficulty in remembering that the same principle applies to the vitamins” (Linus Pauling, HOW TO LIVE LONGER AND FEEL BETTER, pg 142). How do scientists or the lay public choose among competing theories? The first step is to analyze the mass of data and try to identify facts. For the purposes of this discussion, we focus on cardiovascular disease, and not necessarily myocardial infarction, or heart attack. The Pauling/Rath Vitamin C Theory is about the cause of and treatment for occlusive cardiovascular disease. We are not aware of any contradictions to the above list, and we welcome suggestions for additional assertions of fact for purposes of debate. There are also common observations that may be relevant. The cardiovascular disease process seems to be accelerated in older people, in people who consume polyunsaturated fats without adequate vitamin E, and in people who undergo common heart by-pass surgery or angioplasty. Popular writers such as Adell Davis in the 1950s, 1960s and 1970s and forward have helped disseminate the scientific knowledge of the health value of supplemental nutrition, especially vitamin C. As the knowledge became more widespread, the CVD mortality rate has stopped increasing and began to decrease. Young people are known to have CVD and people in their 30s die from Myocardial Infarction or heart attack. Older people do suffer peripheral arterial disease, but CVD is generally localized to the coronary and carotid arteries near the heart. A frank copper deficiency has been implicated in atherosclerosis. The author is not aware of any individual who regularly and consistently consumes more that 10,000 mg of vitamin C daily (along with 300 mg CoQ10) who suffers any form of cardiovascular disease. The two crucial observations or facts that may help out sort out the several theories are that animals do not generally suffer the same type of CVD as humans, and plaques formations are uniform, not randomized, and usually in arteries near the heart. The first observation, that animals do not generally suffer CVD, indicates that there is a difference in the genetic makeup between humans and most other animals. We fail to see how any popular theory, save perhaps diet, can explain this phenomenon. One of the largest differences between most animals and humans is that we humans are virtually alone (with the guinea pig) in that we do not make any vitamin C in our bodies. Other mammals make 3000 to 11000 mg of vitamin C in their livers (adjusted for body weight), which goes directly into the blood stream. Humans can not make a single molecule of vitamin C.
The second observation, that plaque deposits are uniform close to the heart, tends to rule out poisons circulating in the blood (e.g. oxidized cholesterol, fats or homocysteine) as being the primary cause of CVD, although these substances probably aggravate or accelerate the disease. The cholesterol, homocysteine, oxidized cholesterol, microbe, fat, and even heavy metal/free radical theorists have yet to explain why plaque deposits are not randomly distributed throughout the blood stream. One must ask why infarctions do not occur in the ears, nose and fingers if something in the blood, such as fat or homosysteine, causes the lesions leading to CVD. The Vitamin C Theory explains these observations as the effects of mechanical stress on arteries without sufficient collagen to remain strong and resilient. Lesions or cracks develop that attract Lp(a). The vitamin C (collagen) Theory of atherosclerosis explains the vitamin B6 connection and copper, which are both required to produce collagen. Usually the deficiency of vitamin C is the primary factor. For example, vitamin B6 and copper are not usually implicated in scurvy. Vitamin C’s antioxidant properties and ability to support the immune system are well known, which may also explain away the oxidized cholesterol findings as well as the microbe theory. Irwin Stone has suggested that vitamin C is really not a vitamin, and is better classified as the ‘Missing Stress Hormone’ in humans. The latest research from Dr. Maththias Rath’s group on so-called transgenic mice (mice genetically engineered to not make their own vitamin C) now provides virtually ironclad “proof” that low vitamin C, leading to elevated lipoprotein(a) causes heart disease. The common theories for heart disease fail when faced with two simple observations. Plaques do not generally form in animals that make their own vitamin C, and plaques do not form randomly in humans throughout the blood stream. These two observations are the cornerstone of the Pauling/Rath unified Vitamin C theory. The Vitamin C Theory, which holds that Lp(a), an LDL variant, acts as a surrogate for vitamin C, also fits all other known facts and most observations. It makes sense, and is almost too simple. It is hard to believe that medical science could have overlooked it, but this is precisely the reason Pauling himself gave for writing his first book on Vitamin C. He wanted to counter the medical profession’s bias against the vitamins, especially ascorbic acid (Linus Pauling in his Own Words, Edited by Barbara Marinachi). 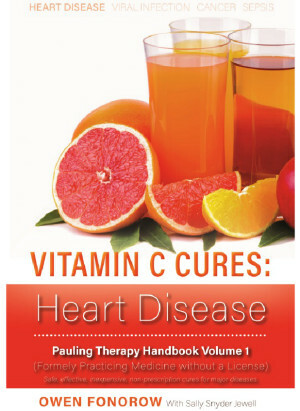 Others may offer additional facts and observations, however this author is convinced, now after more than twenty years recommending it to heart patients, that the Pauling/Rath theory is essentially correct, and that the Linus Pauling’s high-dosage vitamin C/lysine therapy is the cure for CVD. The author does not understand why humans evolved so differently from most animals. How did we survive as a species without the ability to manufacture our own vitamin C? One is reminded of the fictional “Lysine Contigency” in Jurassic Park. There is little doubt that this great deficiency in our genetic makeup, the lost ability to produce the enzyme L-gulonolactone oxidase in our livers, an enzyme that would otherwise allow us to convert ordinary glucose (sugar) into ascorbic acid, is what ultimately causes many ills of humankind. The Houston-based Vitamin C Foundation has applied to the U. S. National Institutes of Health (NIH), and the National Center for Complimentary and Alternative Medicine (NCCAM) for a grant to study 6 g vitamin C and 6 g lysine as a therapy for heart disease. If funded, the study would be the first-ever clinical trial in humans of the high oral vitamin C and lysine intervention, first suggested by Linus Pauling in 1994. The study design is somewhat unusual, in that there will be one study group with elevated serum Lp(a), but there will be no placebo. Because the Vitamin C Foundation and its investigators cannot deprive patients of vitamin C for a lengthy period, the pilot study will first monitor Lp(a) and other assessments for all study participants during a two-month baseline period without any intervention. These two months will act as the control on which to base the statistical analysis. This method is designed to overcome some of the more obvious objections to a long-term trial. These objections include the subjects having to take a ‘useless’ placebo for 6 to 18 months. Also, this design overcomes many of the problems that A. Hoffer, PhD, and others have written about, both ethical and otherwise. These problems include the patient being deprived of a therapy that may work, the difficulty of preparing a proper placebo for megadose therapies, the fact that patients do not like to cooperate in double-blind experiments leading to the high drop-out rates, the lack of physician time to perform realistic monitoring, the fact that patients may “switch” formulas with each other, and more. “In Sum, I believe that the validity of the double-blind method has been grossly overvalued; iIt has only limited utility. In my opinion it does not reliably prove that effective treatments are effective or that ineffective ones are ineffective. Elsewhere I have examined the reasons why it is such a limited method. The main reason is that it violates the doctor-patient relationships and therefore creates a model that is too far removed the real clinical relationships” (A. Hoffer). There is anecdotal evidence, and thus some reason to believe, that the elevated Lp(a) levels in the Pauling Therapy group can be lowered to zero (less than 3 mg/dl). Dr. R. F.., a biochemist from New Jersey, reported the following during his personal experiment. He added 0 .5 g proline when a blood test revealed elevated Lp(a). This was the only change he made in his daily regimen, which already included supplements and vitamin C and lysine. Doctor R.F. reported that after six months of adding proline his Lp(a) dropped by 40% and that after 14 months there was no detectable Lp(a) in his blood serum. Other physicians familiar with the Pauling therapy report similar effects. Warren Levin, MD, has written a letter to the Journal of the American Medical Association (JAMA) about lowering Lp(a) with high-doses of vitamin C, lysine and proline. If this effect could be monitored in a controlled setting, perhaps across some or most of the entire study group, it would be an outstanding result which we hope would merit further investigation by the National Institutes of Health (NIH) and other medical authorities and researchers. Editors Note: It is a matter of public record that the U.S. government denied this grant proposal, as well as an earlier proposal by the Foundation that would have investigated vitamin C and lysine and its effect on Lp(a) in heart patients. It is interesting that organized medicine may have already run a similar trial on one-half of the so-called Pauling Therapy, i.e. 5 g vitamin C. During this ‘placebo’ controlled trial, both groups were given IV vitamin C and magnesium. While ethical, this approach of giving multivitamins and the vitamin C IV to the placebo group affected the conclusion. The fact was obscured, evidently, that a statistically significant result supporting the Pauling/Rath theory had been produced. This is not an argument for inert placebos but one for making fully correct and less sweeping conclusions in papers. The study was designed to detect a 60-second improvement in treadmill exercise time in a statistically significant way. Vitamin C and magnesium were given to both groups. Thus, using vitamin C and magnesium in the placebo obscured the statistically significant increase in treadmill exercise time in both groups, including the EDTA group. Unfortunately, the JAMA author’s conclusions overlook this statistically significant benefit and called it a “placebo effect.” The possibility that it was a placebo effect is unlikely, based on a meta-review of other Time to Ischemia treadmill studies in MEDLINE. See references. While this author agrees with Hoffer that therapies and interventions are not “proven” by a double-blind placebo controlled trial; on the basis of generally accepted medical terminology, this trial “proves” the significant value of vitamin C in heart patients. In this author’s opinion, based on the JAMA study, which said little about the value of EDTA for CVD and said nothing about the long-term benefits of EDTA; Chelation/ACAM doctors now have a moral obligation to add vitamin C and magnesium to their EDTA based on this “proven” result of the unified theory. Not all ischemia is calcium-based; however, EDTA has a proven affinity for calcium. If a patient receives the contents of an IV bag for three hours, they ought to receive EDTA as well as ascorbate. The air we breathe contains lead, our teeth are full of mercury, our foods and water contain aluminum and other metal and heavy metal toxins. EDTA detoxification has many proven beneficial effects. We now know that EDTA is even a better idea for heart patients when combined with supplements, especially vitamin C and magnesium. 1. Circulation 2000 Oct 17;102(16):1906-11, Low-dose transdermal testosterone therapy improves angina threshold in men with chronic stable angina: A randomized, double-blind, placebo-controlled study. English KM, Steeds RP, Jones TH, Diver MJ, Channer KS. Department of Cardiology, Royal Hallamshire Hospital, Sheffield, UK. 2. Natural progesterone, but not medroxyprogesterone acetate, enhances the beneficial effect of estrogen on exercise-induced myocardial ischemia in postmenopausal women. Rosano GM, Webb CM, Chierchia S, Morgani GL, Gabraele M, Sarrel PM, de Ziegler D, Collins P. Department of Cardiology, Ospedale San Raffaele, Rome, Italy. 3. Am Heart J 2002 Jul;144(1):60-7. Randomized comparison of T-type versus L-type calcium-channel blockade on exercise duration in stable angina: results of the Posicor Reduction of Ischemia During Exercise (PRIDE) trial. Lee DS, Goodman S, Dean DM, Lenis J, Ma P, Gervais PB, Langer A; PRIDE Investigators. St Michael’s Hospital, University of Toronto, Toronto, Ontario, Canada. 4. Indian Heart J 2002 Mar-Apr;54(2):170-5, Bharani A, Ganguli A, Mathur LK, Jamra Y, Raman PG.Department of Medicine, MGM Medical College and MY Hospital, Indore, MP. tanmaybharani@im.eth.net Nowak Z, Petelenz T, Wos S, Lowczynski S.